Need a way to show that special person how much you care? 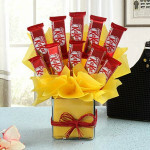 This mesmerising chocolate arrangement is an ideal way to impress that special person in your life. Deliver your love to your dear ones in the form of this splendid choco arrangement.